The “heckler’s veto” is not recognized in American law, but it is increasingly becoming a fact of life in American cities. The hecklers are always from the far left, and they generally come armed. This is a scandal of major proportions, but is rarely recognized as such. A planned right-wing rally in the shadow of the Golden Gate Bridge that was downgraded to a news conference at a small park fizzled further on Saturday, after San Francisco police swarmed the park and city workers erected a fence around it. An organizer for the group Patriot Prayer later spoke in suburban Pacifica with a handful of supporters, after civic leaders and police in San Francisco repeatedly voiced concerns that they would draw angry counter-protesters and spark violence in the area known as the cradle of the free speech movement. Earlier in the week, San Francisco Mayor Ed Lee raised concerns that Patriot Prayer would attract hate speech and potential violence. U.S. Rep. Nancy Pelosi, a fellow Democrat who represents San Francisco, called the planned rally a “white supremacist” event. Organizer Joey Gibson denied his group was looking for trouble. He said members had received anonymous threats on social media and feared civic leaders and law enforcement would fail to protect them. “My hope is to be able to talk to normal citizens without all the extremists,” Gibson, who identifies as Japanese American, said at the news conference. Other speakers included African Americans, a Latino and a Samoan American. Several said they support Donald Trump and want to join with moderates to promote understanding and free speech. Of course, even if they were white supremacists–whatever that means–they would have a right to hold a rally, and would be entitled to the same police protection as any other group, just like Black Lives Matter. So what happened? A vicious mob of antifa fascists swarmed the area while police stood by, threatening the “right wing” rally. 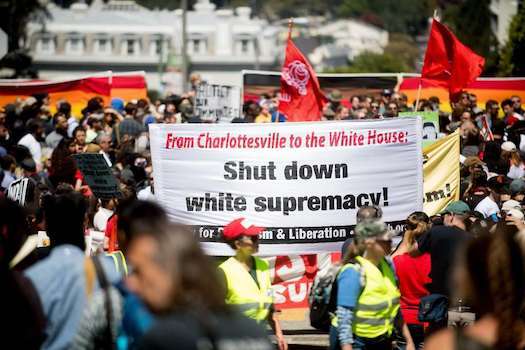 The pivots by the group didn’t deter more than 1,000 left-wing counter-protesters from descending on Alamo Square park, where they suspected right-wing supporters still might show up. Does hunting down your political enemies with baseball bats an ax handles count as “hate”? Of course not! Members of the [Patriot Prayer] group ended the news conference abruptly when they heard members of an anti-fascist movement were headed to Pacifica. The Associated Press describes an armed mob seeking to beat up people with whom they disagree politically as “anti-fascist”–with a straight face! What a time we live in. 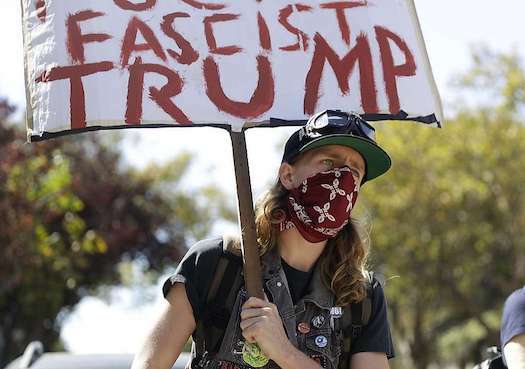 When Gibson canceled the Golden Gate rally on Friday, he said his followers would instead attend an anti-Marxist rally on Sunday in nearby Berkeley. But a short time later, the organizer of that rally called it off. Cummings said the event was planned “to speak out against the political violence happening to people who do not agree” with left-wing ideology, and that the meaning was being lost as rhetoric around the rally escalated. The left-wing group By Any Means Necessary, which has been involved in violent confrontations, had vowed to shut down the Berkeley rally. So those who oppose the far left–surely a majority, even in California–are not allowed to assemble. This is an intolerable (not to mention illegal) situation. It can’t be allowed to continue.